Address: Rizal cor Guanco St.
to make your stay more comfortable our hotel services foods such as express meals at affordable price, laundry & pressing services, e-ticketing of PAL, cebu pacific & oceanjet. Good day, I am Elna C. Batuigas, a graduate of Bachelor of Science in Hotel and Restaurant Management at St.Therese MTC Colleges La Fiesta Site. As a fresh graduate it is nice to hired in a company like yours in order to contribute in manpower, knowledge and skill development. 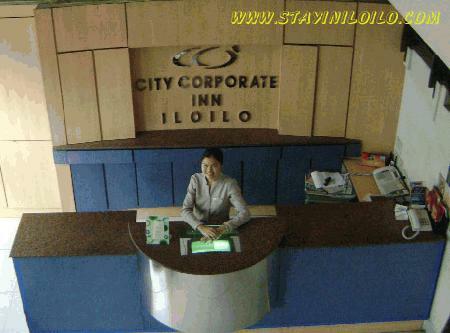 Im done with my 400hours on the job training, 200hours in Club21 RestoBar and 200hours in Iloilo Business Hotel. With that I would like to ask if your company is on job hiring, I am very willing to apply in your establishment in any vacant position. Attached here is my mobile number:09307977946..my FB email address:dhangzkie_24@yahoo.com or email me in my yahoo mail account:batuigas_elna@yahoo.com. I am looking forward for your response. Thank you and God bless. hello,jst wanna ask if meron po kau offer rates per hour?if have,how mch is it? ow much is your per rates single room. Hi.. I would like to ask if its ook if we get the single room for the two of us. Since we dont need to have another. Me and my bestfriend will be sharing the bed. Please inform us if that would be ok.
gud pm im John Ritchel Catotal from Pototan Iloilo.. i would like to ask if your company is on hiring.. i'm a fresh graduate, and i took up Bachelor of Science in Hotel and Restaurant Services and Technology.. i'm done with my 720 hours on the job training in LE SOLIEL DE BORACAY-boracay, island.. if your company is in need of a hotel staff, specifically in Housekeeping Department, i will be glad to apply.. please inform me in my email adress (greennike_08@yahoo.com) or contact me on my mobile # 09484073139.. thank you so much and more power. Good day sir/madam. I am a fourth year Business Administration student major in Human Resource Development Management. with regards to this I would like to ask if your company has HR Department and in case you have, are you accepting on the Job trainee? thank you sir/madam. God Bless. please reserve 1 economy twin bed on nov 29, 2011. how much is the rate, are u near sm city? how many minutes from airport. thanks. do u have a pic of your suite room? is it 1600.00/night? i just want to ask if yung rates nyo po ba per day my food inclusion? may i ask if do you have any vacant position suited for my application.I graduated at northlink technological institute in davao city with a course of a 2 years hotel ande restaurant management an already pass the nc11 of the tesda..and i live in guimaras.I am hardworking and intelligent.please call me in my contact #.09302408294. Sir/Madam: Goos day..may i ask if do you have any vacant position suited for my qualification?..i graduated at ISCOF_Dumangas Campus with the degree of Bachelor of Science in hotel and Restaurant Management last march 2011..i am hardworking, intelligent and dedicated..please dont hesitate to contact me at 09285435815 at your most convenient time..thank you and ni am looking forward for your positive response..god bless! hi, just want inquire for room availability on march 31, 2011 for 3 persons. how much is your rate? thank you very much. Madam malapit ba kayo sa SM Iloilo?? Kasi im from manila may exhibit kami sa SM IloILo on March 27, up to apr. 4, 2011.
i had a request for a standard room from 12th February to 16th February, 2011. i didnt get any replay yet from your side!!! good day just want to ask if youre hiring? i would like to stay in your hotel from 12th to 16th February, 2011. is there any Deluxe room available in your hotel for those days only? Hi, I just want to inquire if you still have available room for 2 this coming January 22-24, 2011? hello, i would like to inquire if u still have available room? Double Pax? this JAn. 22 & 23? Hi! I would like to inquire if you have available room this jan 21-23? hoping to hear from you soon. thanks! can i reserve one suite room and economy roomon january 22, 2011? Availability of deluxe rooms from Feb.3-5, 2011??? Hello there! can i book for a standard room 2pax? we will arrive there on January 13, 2011. thanks much!!! uhmm pwede po ba mag stay ang 2 persons sa single room? good morning! may i ask what are the requirements in applying in your hotel? hi, may i know if your establishment is near the airport? What is the check in and check out time in your hotel? And do you happen to be near in Amigo Terrace Hotel? I'll be in Iloilo with my wifey on 02-05 July 2010, is your standard room 1 bed which I prefer? Kindly qoute, check in after 12 noon on 02 July & check out before 12 noon on 05 July. Thanks. My available pa na deluxe room (3pax) for June 19-21? pls book me single room 1 person, night of May 24, 2010. We want to book for one night --- two (2) DE-LUXE rooms Arriving May 11 and leaving May 12 names are: 1) VICENTE O. ROARING and 2) SOCRATES APOLLO P. BOTICTIC company is Advocate of Philippine Fair Trade Inc. My mobile number is 0917-505-9474.
hi! how far is it from the airport and sm city? hello! !just wanna ask f your company accepting OJT student..send me the requiremants plz..thanks!hoping for your response..
Me & my friend would like to visit iloilo this february 27, do you have availble economy room for the said date? Futhermore, do you have a package tour, how much would it be for a day? good day!do you still have vacant room for two?i want to have a reservation from jan 21 to 24.pls send me an email or contact me with this number for notification...i'll be waiting...thanks..
do u have different rates for weekly or monthly stays? hi there any available single room on feb 1 and 2 2010?pede ba dalawa kami sa isang room? do u still have an available room on jan 23, 2010 for deluxe room? what is the maximum it can accomodate and how much is the additional price per person? economy room (2 pax), is it an airconditionned room?? can a suite room accommodate 5 pax? will there be corresponding charges for extra bed? available on april28-30? You still have available room 2 single bed on April 13,stay for 1 day. can you send me some shots of your economy room? and, can your single room can accomodate 2persons? thnk you. Hello, is there an available standard room on April 2-7. How many can occupy the standard room. My husband and I will be there on the said date and my daughter who is 9 years old. Our daughter will be staying with us on April 2 and April 6 only. What do you suggest what is the best deal you can give to us. Thanks and hope I can hear from you soon. God bless. i would like to ask if the single room can accommodate 2 persons? Do you still have one standard room available on April 3 and April 5? We are going to guimaras and we have to sleep overnight in iloilo on the 2nd of may. We are 6. Can a suite room accomaodate us? how can i make a online reservation to your hotel? we'll be arriving 2nd of April around 5pm and be leaving on the 7th of april before lunch. hi..can i ask if your deluxe room can accommodate up to 8-10 persons?if ever how much is the extra mattress/person?thanks much..